Did you ever wonder how authors pick a book title? Me too. The working title for my new book was always Management Workout. I like it, because the metaphor of workout exercises for management in healthy organizations fits very well with the content. However, with the book nearly finished it was time for a definitive book title. A few weeks ago I had a flash of inspiration and came up with the title Go Boss Yourself! 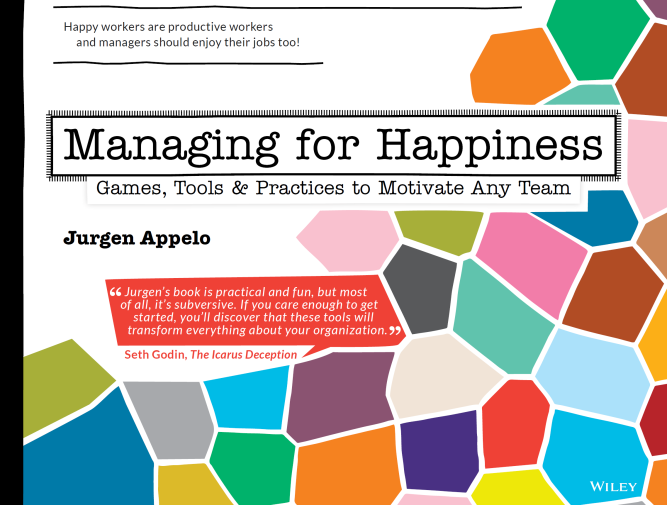 I like this title because it is cheeky, and it emphasizes that people should manage themselves (not others), but it also expresses that many employees in the world would love to send their bosses away. Yo dude, go boss yourself! It is said that most readers pick books based on their title. (You probably won’t admit it, but research says that’s what you do.) Considering that a writer can pick a book title only once, it would be dangerous for me to pick either Go Boss Yourself! or Management Workout, without doing any actual research and validating my assumptions. This blog post describes what I did. Does the title promise valuable outcome or change? Does it trigger intrigue, curiosity, provocation? Does it address a need, something people search for? Does it describe the content in just a few words? Is the title sticky and memorable? Is the title easy and short? Is the title cool, targeting a certain market audience? Does it enable branding and follow-up business? Will you still be happy with it 10 years from now? Do the words communicate the soul of your book? Granted, no title in the world can possibly satisfy all these criteria. But at least this book title checklist can help you get rid of the really bad ideas. After creating the checklist I was ready to generate candidate titles. I had a good look at several web pages which I had already created earlier to describe my book and I marked all the important words on those pages, and I did the same with crucial blog posts. I also asked my readers to offer suggestions for book titles. I didn’t expect any of them to come up with a great title (they didn’t), but I was sure they would offer suggestions with words that I hadn’t yet found (they did). With all these words in a spreadsheet I then used on-line dictionaries to find synonyms and I used the Google AdWords Keyword tool to find related keywords. The result was a big pile of almost 50 useful words. I was ready for the next step. 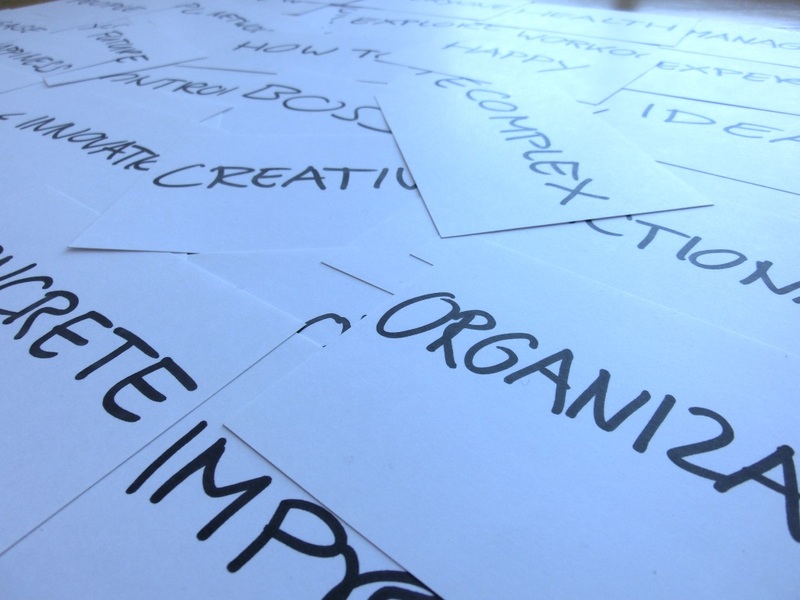 I wrote all words on paper cards and started randomizing and sorting them in many possible ways on a big table. I made silly patterns, and I laid them out as if I was playing with Tarot cards. With different patterns before my eyes I read phrases left-to-right, right-to-left, up-and-down, diagonally and in circles, until I was almost feeling dizzy. 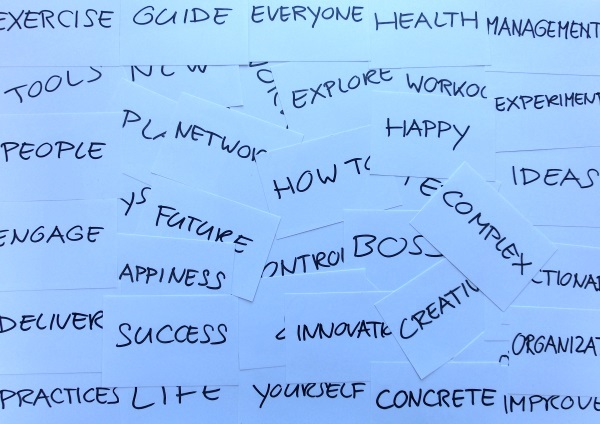 In just a few hours I came up with at least 20 useful titles for my book. It was time to start narrowing it down. After another hour I had only seven “good enough” book titles left. What better way to test titles than checking which ones people actually click on by showing them as advertisements? Sure, clicking an ad is not the same as buying a book, but at least it gives an indication which of the titles are best able to catch people’s eye. So I applied the same strategy as Tim Ferris and I bought a dozen keywords on Google AdWords and directed them to temporary landing pages on my website. The results were interesting and surprising. The titles most clicked, according to Google, were The Best Things in Work-Life and Work-Play Balance, while Happy People, Healthy Organization was the least effective. My own favorite Go Boss Yourself! only came in third. Not what I expected! A click test on Google uses input from people who don’t know me, and who don’t know my work. But what about the people who do know who I am and what I write about? It was definitely worth asking them as well. Fortunately, I have a mailing list with 2300 subscribers (are you on it?) So, I ran a readers poll and asked my own audience for their input. I included the original working title, and 2 extra titles to make a nice list of 10 options. 438 people completed the poll and I was again confronted with results I had not expected. A vast majority of my own readers preferred the title Management 3.0 Workout, which was the working title they were already used to. 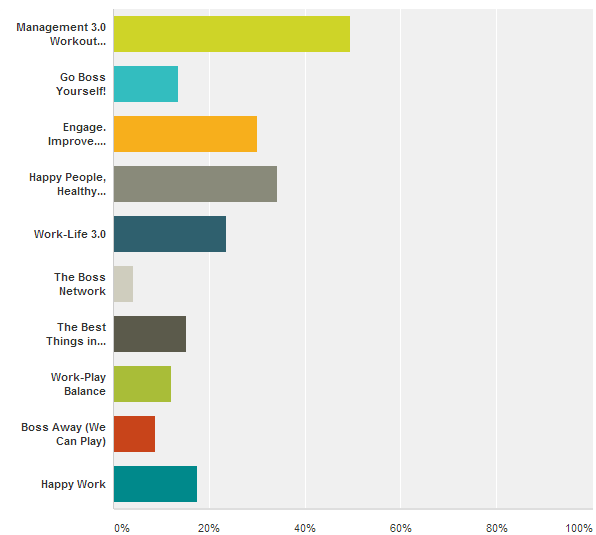 The next best were Happy People, Healthy Organization (which was the least effective in the click test) and Engage. Improve. Deliver. The least popular were all titles with the word “boss” in them, including my own favorite, Go Boss Yourself! Picking the “best title” for a book is like choosing the “best name” for a baby. You’re stuck with it for a long time, and no matter what you choose, everyone will think you could have done “better”. I had hoped the click test and readers poll would help me choose, but instead the decision only became more difficult! The favorite titles among my own readers were the opposite of what emerged from the click test on Google. And my own favorite was not a winner, neither in the click test nor in the readers poll. What to do with all that input? Which input is more important? The opinion of my existing (core) audience, the behavior of my new (extended) audience, or my own radical ideas? What should it do for me? Well, that’s easy! 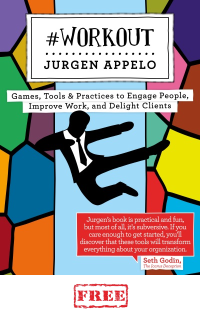 The purpose of the book is to be a trigger for Management 3.0 events, licensing and games. 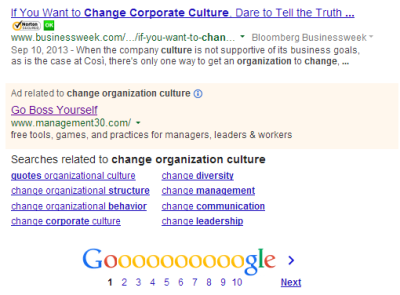 That means the Management 3.0 brand should be emphasized, not diluted, with the book title. 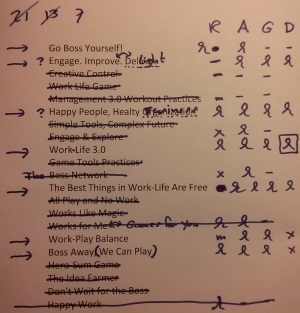 The book Management 3.0 Workout offers concrete practices, tools, and games for all workers so they can introduce better management, with fewer managers. With this new book, and its one-day workshop, you can change your organization’s culture, step-by-step, starting tomorrow. 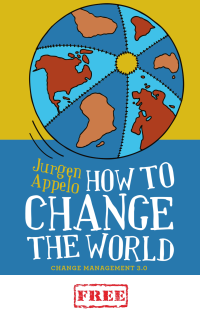 The book is supported with a global book tour. OK, the title is not as catchy as “Go Boss Yourself!” But I can still use this phrase (and others) in my marketing materials. Besides, as Scott Berkun wrote before, if you check the bestseller lists you can see that very few books have titles that “pass the tests” of great book titles. In other words, who cares? I’ve already benefitted just by learning about this approach to picking a book title. Very nice … and counterintuitive.! I figured that when one writes a book, the title is clear from the beginning. Every time i started to write a book, I started from the title, which was to be the guide of the text that was gushing. That must be why I never managed to get to the publication? Woo Hoo! 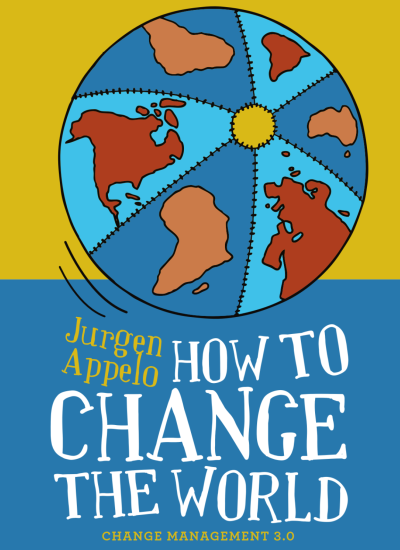 Congrats for the new book, Jurgen. I’m looking forward to read it.